Experience deep relaxation by sinking yourself into our sumptuous thick sheepskin rugs. Select from traditional long wool, from one to eight-piece rugs and exclusive statement short plush pile rectangular accent floor coverings. 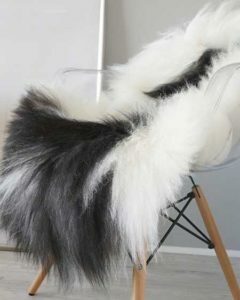 Sheepskin adds an opulent touch to any design style be it contemporary Nordic, minimalist industrial, avant-guard Bohemian, or rustic shabby chic. Free delivery and exchanges on all of our rugs too! Fed up with the sharp pang of cold stone or hardwood floors on your feet? Picture yourself padding across one of our gorgeously thick, sumptuous sheepskin rugs – hand-selected by us for style and softness. These indulgent, decorative floor coverings are inimitably plush and luxurious. A variety of rug types are available – including large rugs and designer styles. There are also many colours to choose from – from more traditional, muted tones of cream, white, fawn and black to baby pink, deep red, green and blue. We curate our collection with care to ensure there’s something to suit each individual taste. Sheepskin is a durable and versatile raw material – which lends itself perfectly to a variety of uses around the home. As a floor covering it is protective, dirt-resistant, allergy friendly and of course irresistibly soft to the touch. Wool fibres allow air to circulate which also helps to regulate the temperature of the space around your sheepskin. At Snugrugs we select only the finest pelts for our products – carefully sourced from trusted farms. These sheepskins are then used whole or meticulously sewn together into a variety of stunning shapes by our artisan suppliers. Part of the beauty of sheepskin rugs is their versatility – they work in almost any home environment and integrate seamlessly into a variety of different interior styles – from contemporary and minimalist to boho and shabby chic. We love these rugs in bedrooms, living rooms and snug areas – ideal for resting your feet after a hard day’s work or settling in and cuddling up on a rainy afternoon. 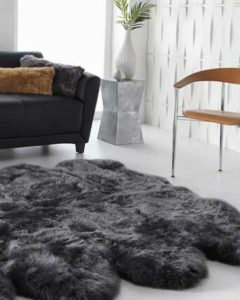 Infuse a touch of pure opulence with a 100% natural sheepskin rug today! Why choose a sheepskin rug? Inspirational yet affordable, sheepskin has stood the test of time. Used for generations for warmth in the form of rugs, throws and clothing, it is a unique natural product. Sheepskins are indulgent and alluring. A single classic rug will add a touch of charm to any setting. Sheepskin is allergy friendly. It naturally resists dirt and dust, making it a great child-friendly choice. Add charm to any room in your house, from a kitchen to a living room. Shearling works so well in laid-back areas the kids can sink into. Wool fibres allow air to circulate, thus regulating temperature, making it super comfortable to lay back for hours on end. The exotic patterns on our Bowron designer rugs give a jaw-dropping wow response. Plunging into deep thick wool is a simple pleasurable experience for grown-ups, little ones and our adorable pets. Beautiful and plush and 100% natural. A sheepskin rug is the perfect accessory for any home or office and has the quality and comfort you deserve. Sheepskin rugs provide the perfect floor covering when you make the right choice. If you are looking for a durable but soft floor covering for your space then this is the answer. Naturally beautiful, your sheepskin will give you hours of pleasure. Choosing a rug for your space and colour scheme can be a daunting prospect so let us help you. Let’s firstly consider colour. Pelts are dyed using strong chemicals to get a desirable colour. Ivory or ‘naturals’ are neutral so will fit well into most schemes. Ivory rugs go very well against wood, stone and leather. Coloured ones look amazing on more shiny surfaces or against neutral leather or fabric sofas. Matching bright colours can be very tricky so why not go for contrasts instead? 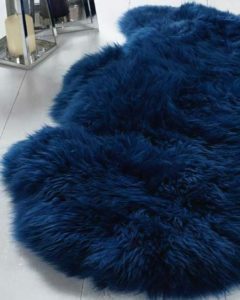 Do not put a coloured rug on a light carpet as the dye is likely to transfer over time. Unless your rug is tanned properly, the wool will fall out and the skin will disintegrate. There are now just two remaining working tanneries left in the UK and ths skins can only be tanned from animals slaughtered in the year that they were born or shorn. For the farmer, the value of the skin can be higher than the meat. British animal welfare regulations are amongst the tightest in the world. ‘Wet’ pelts arrive at the tannery from the abattoir. Each part of the sheep is used for human or animal consumption. Pelts are salted to remove impurities then are treated, rolled, cut and brushed. A brushing machine gives the rug its soft suede back. This process is to this day undertaken by skilled workers. If you want to go more something undyed, consider a rare breed. The colours and patterns on each pelt are unique and textures can vary too. Some breeds have very long coats such as the Icelandic or Merino. Other breeds have beautiful colour markings, such as the Jacob. We have over 50 pure breeds of sheep in the UK and many more hybrids. Wales has more sheep than people. When it comes to size, the most popular sheepskin rug is a single. Single rugs come in four different sizes, from small (80cm) to super large (115cm) Single sheepskin rugs are cut and sewn to form bigger rugs, doubles (2 pelts), triples (3 pelts), quads (4 pelts), sextos (6 pelts) and octos (8 pelts). 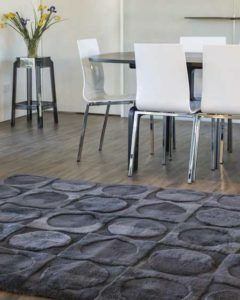 Round and rectangular rugs are sown together from pieces of sheepskin. 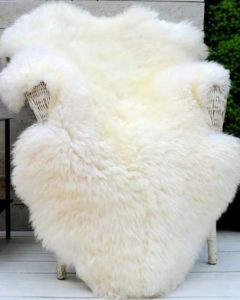 Sheepskin is perfect for walking or laying on. It will look and feel amazing so what are you waiting for? SnugRugs sells an abundance of rugs in all shapes, colours and sizes.